New Canaan (/ˈkeɪnən/) is a town in Fairfield County, Connecticut, United States. The population was 19,738 according to the 2010 census. New Canaan is one of the wealthiest communities in the U.S; in 2008 it had the highest median family income in the country and was listed at #1 on CNN's list of "top-earning towns" in the United States. Considered part of Connecticut's Gold Coast, New Canaan is known for its public school system; which in 2018 was ranked as the top public school system in Connecticut, and in 2008 the 3rd best in the country. About an hour's train ride from Manhattan, the town is known for its wide range of architecture from the Harvard Five modern homes to historic New England colonials and farmhouses, as well as vast public parks such as Waveny Park, and a signature town center with classic boutiques. Residents carol on Church Hill every Christmas Eve, a town tradition since 1916. The town is bounded on the south by Darien, on west by Stamford, on the east by Wilton, on the southeast by Norwalk and on the north by Lewisboro and Pound Ridge in Westchester County, New York. According to the United States Census Bureau, the town has a total area of 22.5 square miles (58 km2), of which 22.1 square miles (57 km2) is land and 0.3 square miles (0.78 km2), or 1.56%, is water. New Canaan is the only municipality on the Connecticut Panhandle that does not border the coast. Such proximity to New York City proved worthy of its own connection to the New Haven Railroad, being the only town to do so. New Canaan station and Talmadge Hill station are both on the New Canaan Branch of the New Haven Line, and transfer is possible in Stamford south to Manhattan. Many New Canaan residents commute to New York regularly, with travel time to Grand Central Terminal approximately 65 minutes. New Canaan is also heavily served by the historic Merritt Parkway, as the third municipality when driving through Connecticut from New York City. The downtown area consists of many fine restaurants, an old Bow Tie Cinemas movie theater, library, the Victorian train station, antique shops, a book store, a saddlery boutique and various fine clothing and interior decorating shops. In addition to the many local boutiques and businesses, many national chains stores can be found in the downtown area, including Ralph Lauren and Ralph Lauren Children, Ann Taylor, J. McLaughlin, Papyrus, Vineyard Vines, Le Pain Quotidien, and Starbucks, among others. There are also several churches in town (Catholic and various Protestant denominations) as well as the historic Roger Sherman Inn, established in 1740. Most major banks and many wealth managements firms have a presence in New Canaan, including J.P Morgan, Merrill Lynch, Wells Fargo, UBS, Citibank and Bank of America, among others. Several hedge funds are also based in New Canaan. The town includes the following sections: New Canaan town center, Talmadge Hill, Ponus Ridge, West, Oenoke Ridge, Smith Ridge, and part of Silvermine (which extends into Norwalk and Wilton). In 1731, Connecticut's colonial legislature established Canaan Parish as a religious entity in northwestern Norwalk and northeastern Stamford. The right to form a Congregational church was granted to the few families scattered through the area. As inhabitants of Norwalk or Stamford, Canaan Parish settlers still had to vote, pay taxes, serve on juries, and file deeds in their home towns. Because Canaan Parish was not planned as a town when it was first settled in 1731, when New Canaan was incorporated in 1801, it found itself without a central common, a main street or a town hall. With the 1868 advent of the railroad to New Canaan, many of New York City's wealthy residents discovered the quiet, pastoral beauty of the area and built magnificent summer homes. Eventually, many of the summer visitors settled year-round, commuting to their jobs in New York City and creating the genteel, sophisticated country ambiance that continues to characterise the community today. In the 1890s, editor Will Kirk of the Messenger wrote an editorial in response to area editors who chided him and New Canaan as the “next station to hell.” An alleged remark by a parched Civil War veteran marching in the Decoration Day Parade on an unusually hot day prompted the exchange. The remark was found untrue and Kirk, after enduring the comments of others, wrote about a “dream” of approaching the Pearly Gates in the company of his fellow editors. All others were turned away but he, Will Kirk, was welcomed, because he, in fact, was from the “Next Station to Heaven.” Since then, the name has been controversial, with residents affectionately using the latter, and local critics of New Canaan still using the original nickname. The film The Ice Storm (1997) shows many of New Canaan's modern houses, both inside and out. The film (and Rick Moody's novel of the same name, upon which it's based) takes place in New Canaan; a mostly glass house situated on Laurel Road is prominently featured. In 2017, the mill rate of New Canaan was 16.669. The New Canaan Fire Department employs the professional firefighters of the New Canaan Fire Department, as well as the volunteers of the New Canaan Fire Company, No. 1. Founded in 1881, the New Canaan Fire Department is a combination professional/volunteer fire department that operates out of a fire station located near the center of town, with a fire apparatus fleet of engines and other vehicles. The New Canaan Fire Department responded to 886 calls for service in 2009. The New Canaan Police (NCPD) are headquartered at 174 South Avenue. The Department has forty-five sworn officers, five full-time civilians and two school crossing guards. The primary mission of the New Canaan Police department and its Officers is the protection of all persons and properties within its jurisdiction. The New Canaan Police Department responded to 16,741 calls during the year of 2012. As of the census of 2000, there were 19,395 people, 6,822 households, and 5,280 families residing in the town. The population density was 876.5 people per square mile (338.4/km²). There were 7,141 housing units at an average density of 322.7 per square mile (124.6/km²). The racial makeup of the town was 95.27% White, 1.74% Hispanic or Latino, 1.04% African American, 0.04% Native American, 2.29% Asian, 0.01% Pacific Islander, 0.38% from other races, and 0.98% from two or more races. In the town, the population was spread out with 31.2% under the age of 18, 3.3% from 18 to 24, 25.4% from 25 to 44, 26.6% from 45 to 64, and 13.5% who were 65 years of age or older. The median age was 40 years. For every 100 females, there were 91.2 males. For every 100 females age 18 and over, there were 85.7 males. The New Canaan Public Schools system is considered to be one of the best in Connecticut. It has also gained national recognition for its high performance; for example, a recent edition of Forbes magazine rated New Canaan as the third-ranked school district in the United States "for home value" for communities with a median home price of $800,000 or greater. In 2018, New Canaan High School was ranked the best public high school in Connecticut, and one of the top 200 in the nation. New Canaan is one of the few school systems in Connecticut to offer foreign language instruction to students pre-middle school, as a Spanish program exists for all grades to expose students to a foreign language earlier on in their lives. Grades 6-12 have language offerings including French, Latin, Mandarin Chinese and Spanish. New Canaan Nature Center Fall Fair: The fair offers activities for all ages from hay mazes to Old Faithful Antique Fire Truck rides to apple sling shots. All Hallows Eve (Halloween) Parade: No matter your costume, children of all ages and their dogs can receive a goody bag and march in the Parade led by Old Faithful Antique Fire Truck which is sponsored by the New Canaan Chamber of Commerce. Holiday Stroll: Hosted by The Chamber of Commerce, downtown New Canaan celebrates with Christmas carolers, the lighting of the trees along Elm Street, the arrival of Santa Claus, and extended store hours. Christmas Carolling on Church Hill (aka God's Acre): Since 1919 New Canaan residents have been gathering on Church Hill every Christmas Eve to sing Christmas carols with the New Canaan Town Band. The New Canaan town band was founded in 1831 and is the second oldest town band in the United States. Easter Egg Hunt: At the Annual Town Easter Egg Hunt, sponsored by the Young Women's League of New Canaan, children are able to collect candy-filled Easter eggs, get their faces painted, take pictures with the Easter bunny, and many other festive activities. Saint Mark's May Fair: carnival rides and May Fair's famous strawberry shortcake. Family Fourth Fireworks: Town residents gather at Waveny Town Park for picnicking, live music, bounce houses, and fireworks. Grace Farms, a nondenominational church in New Canaan, CT.
New Canaan Historical Society - operates seven museums, preserves five historic buildings, collects and preserves material thought to be of local historical value, and supports education programs such as school tours, special exhibits, seminars and publications on New Canaan history. The society was founded in 1889 and is housed in New Canaan's first town hall. Harmony Lodge No. 67 Ancient, Free & Accepted Masons - the oldest voluntary society in the Town of New Canaan. It was chartered by the Most Worshipful Grand Lodge of the State of Connecticut and was the first masonic lodge in lower Fairfield County since 1763. The only Masonic lodge in that area at that time was Union Lodge No. 5 of Stamford which had jurisdiction over Stamford, Greenwich and parts adjacent. This meant that the brothers of Canaan Parish, prior to 1825, had to meet at Union No. 5 which often physically met at Greenwich. Once Canaan Parish was incorporated into a separate town, Brothers Samuel Carter, Jr., John Seely, Eliphalet Weed and several other members, requested the recommendation of St. John's Lodge No. 6 in Norwalk to the Grand Lodge for a charter to establish a new lodge in the Town of New Canaan which was granted on May 30, 1825. 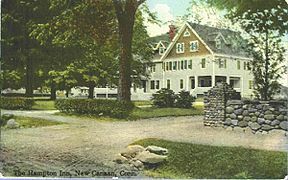 Also during that year, New Canaan's first town hall building was nearly complete and the town offered Harmony Lodge No. 67 the upstairs area as a meeting hall for their lodge for the total annual cost of $20. 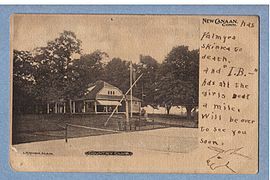 On January 2, 1917 Francis E. Green, who had bought the old Baptist Church on Main Street, which still stands today next to the present Fire House, sold this building to the Fellowcraft Club of New Canaan, Inc. making this Harmony Lodge's first permanent home. In 1954 the lodge in a three-way swap bought the old Methodist Church building on Main Street, and Harmony Lodge No. 67 has been at this present sight ever since. New Canaan is served by a town newspaper, New Canaan News. Two daily newspapers also serve the surrounding area: Connecticut Post and Greenwich Time. Moreover, Newcanaanite and the New Canaan Patch produce online news for residents. In August 2018, two lunch ladies from the school were arrested and accused of stealing about $500,000 from the cafeteria over a five-year period. The school received nationwide attention for the arrests. On October 2, 2018, an EF-2 tornado struck the town after a Tornado Watch was issued. New Canaan, by Bill Wurtz. In the song, he initially erroneously refers to the town as being in Pennsylvania before admitting the town's true state. "It's [Darien's] detestable, but that's the way it is. It's even worse in New Canaan. There, nobody can sell or rent to a Jew." Gentleman's Agreement (1947 film). The 1955 novel Auntie Mame takes place partly in New Canaan, disguised under the name of "Mountebank" but identified (in the stage version) as "Just passed Darien. You'll love it. It's the most restricted community in our part of Connecticut." New Canaan author Edward Eager set two of his children's books in the town: Magic or Not (1959) and The Well-Wishers (1960). In The Cricket In Times Square (1960), main character Chester Cricket lives near New Canaan. The Official Preppy Handbook (1980) makes reference to New Canaan as one of the "preppiest" towns in the country. In the 1997 movie Fools Rush In, Matthew Perry's character grew up in New Canaan. In the Syfy television series Warehouse 13, in "There's Always a Downside", former Warehouse agent Hugo moves to New Canaan with his nephew and calls the Warehouse agents to retrieve a bag of marbles that caused students in a fictitious school to be consumed with a single, overriding goal. In the Stephen King series The Dark Tower, protagonist Roland Deschain hails from a fictional city called Gilead, who in turn is nestled in a fictional country/ state called New Canaan. ^ a b "Race, Hispanic or Latino, Age, and Housing Occupancy: 2010 Census Redistricting Data (Public Law 94-171) Summary File (QT-PL), New Canaan town, Connecticut". U.S. Census Bureau, American FactFinder 2. Archived from the original on September 11, 2013. Retrieved August 9, 2011. ^ Chang, Althea (July 16, 2008). "25 Top-Earning Towns". CNN. ^ "New Canaan Public Schools Ranked Tops in CT; 19th Best in the Country | Patch". New Canaan, CT Patch. Retrieved 2015-12-09. ^ "'A Sacred and Treasured New Canaan Tradition': A History of Christmas Caroling at God's Acre". Newcanaanite.com. Retrieved 3 December 2018. ^ "Where did the nickname — "Next Station to Heaven" — originate? | New Canaan Answerbook". Newcanaananswerbook.com. Retrieved 2016-01-18. ^ results, search (17 July 2006). "The Harvard Five in New Canaan: Midcentury Modern Houses by Marcel Breuer, Landis Gores, John Johansen, Philip Johnson, Eliot Noyes, and Others". W. W. Norton & Company. Retrieved 3 December 2018 – via Amazon. ^ "New Canaan Board of Finance sets mill rate". Newcanaan.info. Retrieved 11 April 2018. ^ "Home - New Canaan Volunteer Ambulance Corps". Ncvac.org. Retrieved 29 March 2018. ^ "New Canaan Fire Company – New Canaan, CT". Newcanaanfire.com. Retrieved 29 March 2018. ^ "New Canaan - Police Commission". Newcanaan.info. Retrieved 29 March 2018. ^ "New Canaan Police Department Annual Report" (PDF). Newcanaanpoliceorg.c.presscdn.com. 2012. Retrieved 3 December 2018. ^ "National Historic Landmarks Program (NHL)". 5 April 2007. Archived from the original on 5 April 2007. Retrieved 3 December 2018. ^ "Halloween Parade". Newcanaanchamber.com. 3 October 2013. Retrieved 3 December 2018. ^ "Holiday Stroll". Newcanaanchamber.com. 18 October 2013. Retrieved 3 December 2018. ^ "Christmas Eve on God's Acre - The Congregational Church of New Canaan". 10 April 2015. Archived from the original on 10 April 2015. Retrieved 3 December 2018. ^ "Family Fourth Fireworks - New Canaan Chamber". 28 August 2014. Archived from the original on 28 August 2014. Retrieved 3 December 2018. ^ Feinstein, Estelle (1976). Stamford From Puritan to Patriot: The Shaping of a Connecticut Community, 1641-1774 (1st ed.). Stamford: Stamford Bicentennial Corp.
^ Mason, Post. "Harmony Ladge #67". Retrieved November 3, 2017. ^ Hubbard, Frederick A. (1922). Masonry In Greenwich. Greenwich, Connecticut. ISBN 978-1258186159. ^ a b King, Mary Louise (1931). Portrait of New Canaan (1st ed.). Chester, PA: John Spencer, Inc. pp. 144, 147, 275. ISBN 0-939958-00-7. ^ "Lunch Lady Sisters Accused of Stealing Nearly $500,000 From School Cafeterias". Time.com. Retrieved 3 December 2018. ^ "Tornado confirmed in New Canaan, survey team studying Norwalk damage". Msn.com. Retrieved 3 December 2018. ^ Wurtz, Bill (May 6, 2014). "song: new canaan". ^ "Moviequotes.com Repository - Movie Quote From Gentleman's Agreement - 1947". Moviequotes.com. Retrieved 29 March 2018. ^ Lawrence, Jerome; Lee, Robert E. (1999). Auntie Mame. Dramatists Play Service Inc. p. 91. ISBN 0822217309. Retrieved 2015-04-15. ^ Smith, Warren Allen (2012). Unforgettable New Canaanites. Lulu.com. p. 77. ISBN 1105647439. Retrieved 2015-04-15. Allison Howell Williams (born April 13, 1988) is an American actress who played Marnie Michaels on the HBO comedy-drama series Girls and was critically acclaimed for her performance in the 2017 horror film Get Out. Connecticut's 143rd House district is one of 151 Connecticut House of Representatives districts. It is represented by Gail Lavielle. The district consists of Redding, Ridgefield, Westport, and parts of Bethel, New Canaan, Norwalk, Weston, and Wilton. In the 2018 election, Democrat Stephanie Thomas challenged Lavielle for the seat. The irregularity in the boundary is the result of territorial disputes in the late 17th century, culminating with New York giving up its claim to this area, whose residents considered themselves part of Connecticut. In exchange, New York received an equivalent area extending northwards from Ridgefield, Connecticut to the Massachusetts border, as well as undisputed claim to Rye, New York.The two British colonies negotiated an agreement on November 28, 1683, establishing the New York–Connecticut border as 20 miles (32 km) east of the Hudson River, north to Massachusetts. The 61,660 acres (249.5 km2) east of the Byram River making up the Connecticut Panhandle were granted to Connecticut, in recognition of the wishes of the residents. In exchange, Rye was granted to New York, along with a 1.81-mile (2.91 km) wide strip of land known as the "Oblong" running north from Ridgefield to Massachusetts, alongside the New York counties of Westchester, Putnam, and Dutchess. Martin Davis Eichelberger, Jr. (born September 3, 1943) is an American professional golfer who has won several tournaments at both the PGA Tour and Champions Tour levels. Eichelberger was born in Waco, Texas. He started in the game at the age of 13 in the junior programs at his family's golf club in Waco. He attended Oklahoma State University in Stillwater, Oklahoma; and while there blossomed into an outstanding amateur. He led the Oklahoma State Cowboys to the 1963 NCAA Championship. He graduated in 1965 and turned pro in 1966. Eichelberger has twelve professional victories. Four of which came on the PGA Tour, plus six Champions Tour triumphs. On his way to a win at the 2002 Emerald Coast Classic, Eichelberger made a hole-in-one from 185 yards at the par 3 eighth hole during the first round of play. Although he is a native Texan, Eichelberger lived most of his adult life in New Canaan, Connecticut. In 2003, he moved to Honolulu, Hawaii, where he lives today with his wife, son and daughter – fraternal twins. The New Canaan Nature Center (40 acres or 16 hectares) is a botanical garden, arboretum and nature preserve located at 144 Oenoke Ridge, Route 124, about .25 miles (0.40 km) north of the center of New Canaan, Connecticut. The nature center includes wet and dry meadows, two ponds, wet and dry woodlands, dense thickets, an old orchard, and a cattail marsh, as well as a 4,000-square-foot (370 m2) greenhouse. Landscaped areas of the site include a wildflower garden (which won the 1997 Homer Lucas Landscape Award from the New England Wild Flower Society), a herb garden and a perennial border. About 90% of the plant specimens in the wildflower garden are native species, including bloodroot, columbine, mayapple, jack-in-the-pulpit, wild geranium, Solomon's plume, starflower, and trillium. Shade-loving perennials include bleeding heart, crested iris, Jacob's ladder, hepatica, European ginger and Virginia bluebells. Azaleas, rhododendrons and a stand of mountain laurel also feature. The center also contains a small arboretum of Sciadopitys verticillata (Umbrella Pine), Chamaecyparis pisifera Squarrosa (Moss Sawara Cypress), Chamaecyparis pisifera Plumosa (Plume False Cyprus), Pinus densiflora ‘Umbraculifera’ (Japanese Umbrella Pine), Fagus sylvatica ‘Atropunicea’ (Purple Beech), Fagus sylvatica ‘Pendula’ (European Weeping Beech), Cercis canandensis (Eastern Redbud), Acer palmatum ‘Dissectum-Pendula’, Pinus cembra (Swiss Stone Pine) and Picea apies ‘Repens’ (Weeping Norway Spruce). New Canaan Nature Center features many nature programs throughout the year, including the Fall Fair every October, and maple sugaring celebrations in early spring. The New Canaan station is a commuter rail stop on the New Canaan Branch of the Metro-North Railroad's New Haven Line, serving as that branch's northern terminal. It is officially located at 198 Elm Street at Park Avenue in New Canaan, Connecticut. The Rayward–Shepherd House, also known as Tirranna and as the John L. Rayward House, was designed by renowned architect Frank Lloyd Wright and built in New Canaan, Connecticut in 1955 for Joyce and John Rayward. Although commissioned by the Raywards, Herman R. Shepherd completed the design after purchasing it in 1964. William Allin Storrer credits Shepherd's actions with salvaging the house, repairing the poor work that Storrer attributes to John Rayward's "constant pursuit of the lowest bid." "Tirranna" is an Australian aboriginal word meaning "running waters," an apt name for this spectacular residence. Located on a pond just off the Noroton River, it features elaborate land and water-scaping. Built of standard concrete block (not Wright's more typical textile block), glass, and Colorundum flooring, and trimmed with Philippine mahogany, most of the house conforms to a hemicycle plan. Its living/dining wing overlooks a pool which steps down to a pond and extensive landscaped gardens, designed by Frank Okamura, landscape architect for the Brooklyn Botanic Garden. Charles Middeleer, a notable local landscape architect, also contributed to the landscape design.The Rayward House includes a later (1958) extension by Taliesin Associated Architects, featuring an observatory above the master bedroom dressing room, as well as a playhouse for the Raywards’ daughters, Victoria and Jennifer (1957), also designed by TAA, which echoes the hemicycle form of the main house. It had been purchased in the late 1990s by businessman Ted Stanley and his wife Vada. After Stanley's death, the property with 15-acres was put on the market in January 2017 for $8,000,000 USD by his heirs. Samuel Mowbray Hammond (October 24, 1870 – November 20, 1934) was an American football coach and physician. He served as the head coach at Purdue University for one season in 1896 and at Lehigh University for one season in 1897, compiling a career record of 7–9–1. St. Luke's School is a private, secular, co-educational day school founded in 1928 and situated on a 40-acre (160,000 m2) campus in New Canaan, Connecticut. St. Luke's offers a college-preparatory curriculum for grades 5 through 12, with a diverse student body of 553 from 20 towns in Connecticut and New York. The school's motto is Enter to Learn, Go Forth to Serve. St. Luke's operates radio station WSLX (91.9 FM). The Talmadge Hill station is a commuter rail stop on the New Canaan Branch of the Metro-North Railroad's New Haven Line, located in New Canaan, Connecticut. It is officially located at 1 Talmadge Hill Road in New Canaan, just south of the Merritt Parkway. WSLX (91.9 FM) is a non-commercial high school radio station licensed to serve New Canaan, Connecticut. The station is owned by St. Luke's School in the same town and licensed to the St. Luke's Foundation, Inc. It airs a Variety music format.The station was assigned the WSLX call letters by the Federal Communications Commission. Will Haskell (born 1996) is an American politician and a member of the Connecticut State Senate, representing District 26. 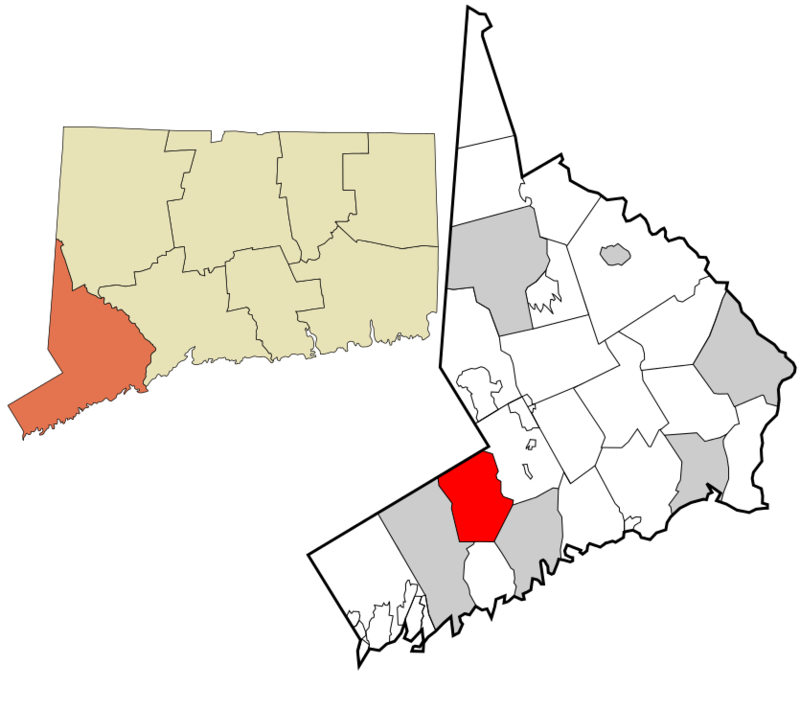 The district encompasses the towns of Redding, Ridgefield, Wilton, and parts of Weston, Westport, and New Canaan. Haskell is a member of the Democratic Party and the Senate Democratic Caucus. William Orville Ayres (September 11, 1817 – April 30, 1887) was an American physician and ichthyologist. Born in Connecticut, he studied to become a doctor at Yale University School of Medicine.